Significant changes were made to the underlying architecture of IDrive for Mac accounts starting 10-31-2011. The current feature-set is described on the regular IDrive Website. This page describes the significant aspects of the earlier architecture and provides information on how to refer to the earlier architecture related description. 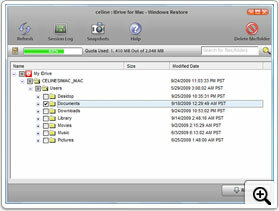 IDrive for Mac retains earlier file copies via Snapshots technology. Snapshots are point-in-time images of the file at a particular time, everyday. The current limit for Snapshots is set for 10 days and this may change without notice. This implies that in case you had a prior version that was backed up in the last 10 days, you should be able to recover via Snapshots technology. 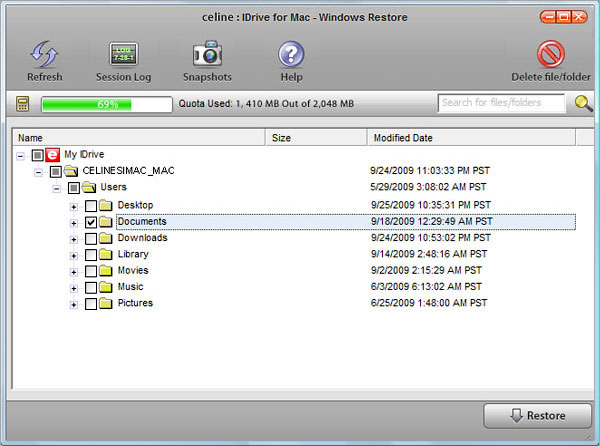 Restore your Mac data from your online account to the Windows PC. The key features include quick search to easily locate backed up files, Snapshots for historical view of data and logs for details on the restore operations.